The inaugural Loot Crate DX monthly box will feature collectibles from the notable franchises of . 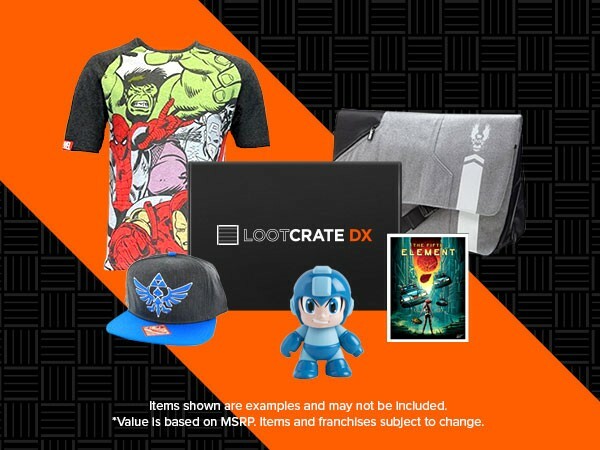 Loot Crate DX will be centered around a monthly theme and will “feature collectibles, apparel, home goods and more for a total retail value of over $100.00†.” Beginning on Monday March 21st, 2016, fans can begin to sign up for Loot Crate DX by visiting http://www.lootcrate.com/lcdx which is priced at $49.99 (including shipping and handling). Loot Crate™ was founded in 2012 by an entrepreneurial team of geeks and gamers who thought that online retail was missing the sense of community, interactivity and mystery that we fell in love with at shows like Comic-Con and PAX. We emphasize phenomenal support and content, and include gear from some of the most respected entertainment and consumer product companies in the world.